Burns are some of the most serious workplace injuries employees can experience, and they can take a large toll physically, mentally, and financially. Medical care and recovery can take days, weeks, months, or even years depending on the severity, so proper compensation of employees for their injuries is crucial. Here we’ll discuss common types and causes of burns, occupations at higher risk for burn injuries, and what you can do if you suffer a burn injury while on the job. Burns can be external, internal, or both. External burns can be caused by sources of heat such as fire, steam, hot surfaces, chemicals, radiation, or electricity. Examples of internal burns are electrical shock, ingesting chemicals, or inhaling superheated liquids or gases. Burns are further broken into several classifications to indicate their severity. First Degree – The mildest classification of burn; only the outermost layer of skin is affected. The area will be red and painful, but no blistering or permanent damage occurs. Second Degree – The outer layer of skin is affected as well as the dermis (the layer underneath). The area will be red and swollen and potentially blistered; permanent scarring or change of skin color may occur. Third Degree – The outer skin layer and dermis are both destroyed. Rather than red, the area may be white, yellow, brown, or black with damage to the nerve endings. Fourth, Fifth, and Sixth Degree – The deepest and most severe of burns; all layers of skin as well as muscles, tendons, and bones may be destroyed. This classification of burn can be life-threatening or fatal. 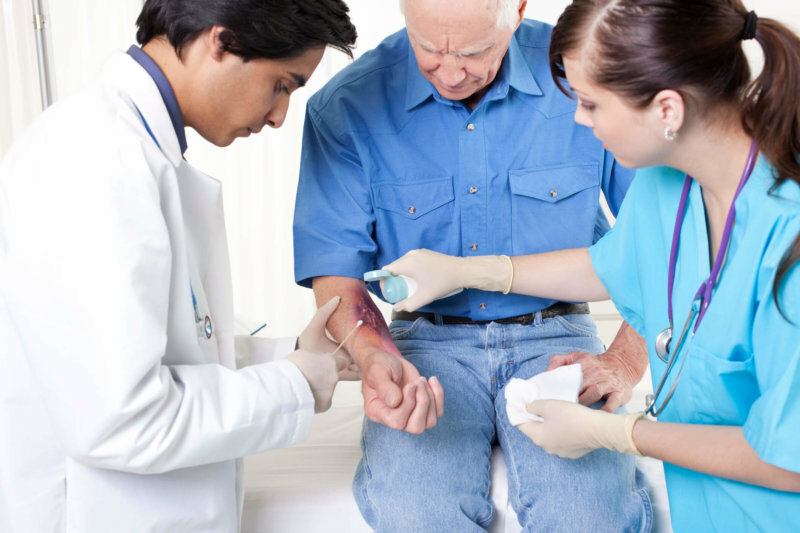 According to the National Institutes of Health, one of the most common work-related burn injuries is chemical burns. Greater care and safety training should be given for anyone working in these industries or occupations. Generally, there are two ways you can attempt to handle receiving compensation for your injury: applying for workers’ compensation benefits or filing a work accident lawsuit. Workers’ compensation benefits (workers’ comp) is a special kind of insurance that helps to protect employees and employers from financial losses due to workplace injury or illness. Workers’ comp helps cover employee expenses for medical bills, lost wages, and vocational rehab. In the event of death, it can also provide death benefits to cover funeral expenses and support payments to dependents. Workers’ comp will not cover injuries caused by employee negligence (including the influence of drugs or alcohol), intentionally sustained injuries, or injuries caused by an altercation started by the employee. It will also not cover injuries sustained while commuting to or from work. Workers’ compensation benefits typically mandate the relinquishment of the employee’s right to sue their employer, but in certain circumstances it is still possible — or necessary — to file a lawsuit. For example, not all states require employers to provide workers’ compensation benefits. Additionally, certain employees aren’t covered by workers’ comp benefits, such as freelancers/contractors, consultants, seasonal workers, and more. If this is the case for you, you may need a personal injury attorney to assist you with receiving the necessary compensation for your injuries. If you’ve suffered a workplace burn injury and would like more information about your options, talk to one of our Minneapolis burn injury lawyers today for a free, no-obligation consultation. We’ll give you our honest advice about how you should proceed.